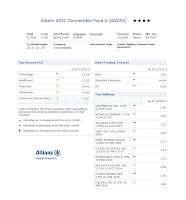 As the top rated convertible bond mutual fund, Allianz AGIC Convertible A fund offers an alternative investment choice for investors. This convertible bond fund provide a choice for investor a fixed income investment with coupon payments (yield) and chance to benefit from an increase in the company’s stock. Details review about this best fund is described below. 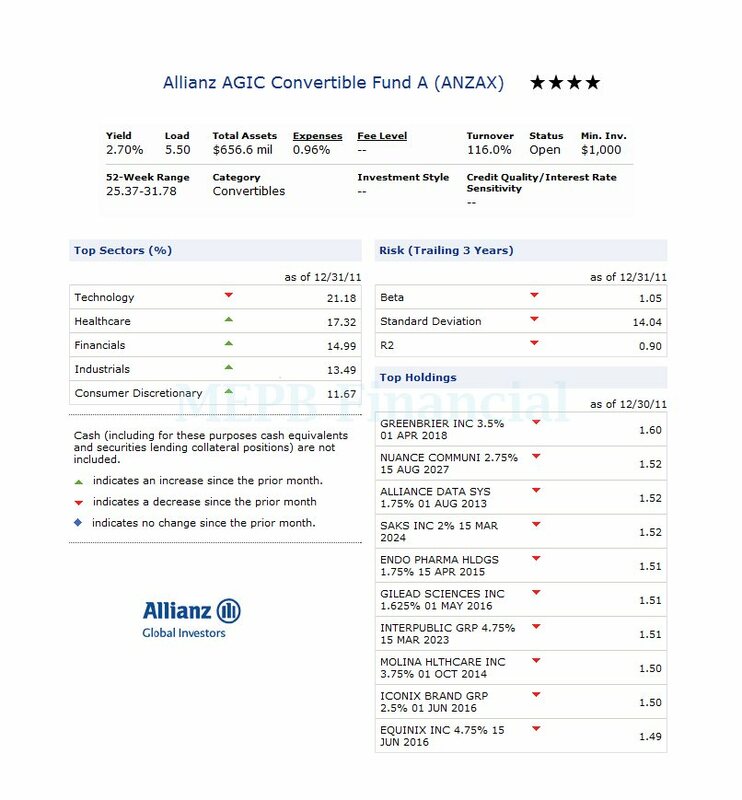 Allianz AGIC Convertible A (ANZAX) fund seeks maximum total return which consist of capital appreciation and current income. The fund invests most of its net assets (>80%) in convertible securities. The investment may include corporate bonds, debts, notes or preferred stocks, and their hybrids. It may invest in securities of any size market capitalization or credit quality. It may rarely invest a significant amount of its assets in securities of smaller companies. The fund also invests <20% of net assets in nonconvertible debt securities. The fund’s managers are Douglas G. Forsyth and Justin M. Kass. The Institutional Class of this fund (ANNPX) was introduced to public in April 1983, while the Class A (ANZAX) is available for sale in April 2010. The fund also has a net annual expense ratio of 0.96% which is a bit lower compared to the average in the Short-Term Bond category (1.10%). The yield of this convertible bond fund is 2.70%. This fund has total net assets of $656 million. The CUSIP of this Class A fund is 01900C680. This best bond fund uses BofA Merrill Lynch All Convertibles Index and Lipper Convertible Securities Funds Average as the fund’s benchmarks. This Allianz AGIC Convertible fund has a sales load of 5.50%. This ANZAX fund is rated 4 stars rating by Morningstar. This fund has a year-to-date return of -2.3% (2011) and 5-year average return of 6.17%. The best 1-year total return was occurred in 1999 with 51.51%. The worst fund’s performance was experienced in 2008 with -28.83%. To invest in this fund, you can buy it from 27 brokerages. You can start by investing with $1000 minimum initial investment for regular brokerage account. For tax deferred account, please check with your brokerage. There are also other classes of this top fund such as Class C (ANZCX), Class D (ANZDX), Institutional Class (ANNPX), Class Admin (ANNAX), Class P (ANCMX), and Class R (ANZRX). The ANNPX fund has the lowest expense ratio, 0.65%. There is no sales load for this Institutional Class. Investment risks are: convertible securities risk, market risk, interest rate risk, liquidity risk, derivative risk, credit risk, etc. The top 10 holdings of this fund as of January 2012 are: Greenbrier Inn 3.5% bond, Nuance Communication 2.75% bond, Alliance Data System 1.75% bond, Saks Inc 2% bond, Endo Pharmaceutical Holdings 1.75% bond, Gilead Sciences Inc 1.625% bond, Interpublic Group 3.75% bond, Molina Helathcare Inc 3.75% bond, Iconix Brand Group 2.5% bond, and Equinix Inc 4.75% bond. The top 5 sectors are Technology (21.18%), Healthcare (17.32%), Financials (14.99%), Industrials (13.49%), and Consumer Discretionary (11.67%).